Fish is the best fertilizer for plants and vegetables. The Pilgrims first learned from Native Americans how to apply fish to fertilize their first crops. It is impossible to over-fertilize with fish. Dried Fish Fertilizer Concentrate contains a natural N-P-K (Nitrogen-Phosphorus-Potash) level of 11-5-1. Unlike the liquid fish emulsion that is preserved with high levels of acid, dried fish powder has no danger of burning the plants roots. The highly concentrated powder in this container is made from and is the equivalent to 16 lbs. of whole fish. FFC is a multi-purpose long-lasting indoor/outdoor fertilizer that can be applied to flowers, trees, and vegetables, and last up to 4 to 5 months between applications. Source: Seagate Fish Fertilizer Concentrate (FFC) is a natural fertilizer derived from whole anchovies and sardines caught along the shores of Baja California. The highly concentrated powder in this container is made from and is the equivalent to 16 lbs. of whole fish. FFC is a multi-purpose long-lasting indoor/outdoor fertilizer that can be applied to flowers, trees, and vegetables, and last up to 4 to 5 months between applications. For most plants, no other source of fertilizer is necessary. Applications: For maximum effectiveness and minimum smell, Seagate FFC should be applied below the surface of the soil, poured into a small hole opened near the plant's roots. The hole should then be completely covered with soil to prevent unpleasant odors from escaping. FFC is a very long lasting fertilizer that works on the principle of utilizing the slow natural bacterial decomposition of the fish into its protein and mineral components. This slow nutrient release prevents the danger of root-burn common to many liquid and chemical-based fertilizers, while continuing to feed the plant a steady diet of the key nutrients for months. Existing plants and flowers – Pour one teaspoon of FFC into the hole. Larger plants and rose bushes may need up to a heaping tablespoon. The ideal time to apply FFC to rosebushes each year is one month prior to the first bloom. For new plantings – Apply at least one teaspoon of FFC into the hole excavated for the new plant. Place the root ball on top of the FFC and cover with soil. Benefits: One application of Seagate FFC can continue to feed plants and flowers up to 4 to 5 months. One container can fertilize hundreds of plants. There is no finer fertilizer that can be applied to your vegetable garden. This product will contribute to huge rose blooms, and insect and disease resistant healthy plants and trees. Seagate FFC is the only fertilizer used on our farm to grow carrots, garlic, and broccoli, and in our garden to grow huge roses. Combines two of nature’s best natural sources of nutrients in one easy-to-apply tablet. This fertilizer is composed of dehydrated sardines and dehydrated seaweed. Unlike most fertilizers that are derived from chemicals, usually petroleum-based compounds, these SoilTabs feed your plant real food. 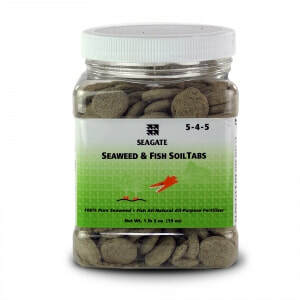 ​Source: Seagate Seaweed & Fish SoilTabs 5-4-5 combines two of nature’s best natural sources of nutrients in one easy-to-apply tablet. This fertilizer is composed of dehydrated sardines and dehydrated seaweed (Giant Kelp - Macrocystis pyrifera). The seaweed is harvested by hand by Seagate’s contract divers. The sardines are captured by local purse-seine vessels. The 1 lb. 3 ounces of tablets in each container were derived from 8 lbs. of raw fish plus seaweed. ​Application: Use 1-2 tablets per quart of soil. More is okay as there is no danger of over-fertilizing and burning the roots. Convenience: There are approx. 275 tablets +/- per container. For existing houseplants or garden vegetables and flowers, these tablets are easily applied. Just press each tablet into the soil around the roots of each plant. The slow-release tablets will continue to fertilize for 2-4 months, depending upon local conditions and water-saturation of the soil. (Soils that are very moist will tend to decompose and consume the tablets more quickly.) This is a very economical way to fertilize hundreds of plants from the tablets in one container of fertilizer. Composition: Unlike most fertilizers that are derived from chemicals, usually petroleum-based compounds, these SoilTabs feed your plant real food. Seagate SoilTabs 5-4-5 (N-P-K) level of nitrogen-potassium-potash is ideal for the flowering stage of plant growth. Seagate Fish Fertilizer Concentrate 11-5-1 is the recommended fertilizer during the plant’s vegetative growth stage. Benefits: Plants that are grown with fish and seaweed rather than chemical fertilizers will be healthier, stronger and more disease-resistant. By pressing the tablets below the soil around the roots, SoilTabs will allow you to fertilize houseplants with fish without the smell. Should you wish to add more tablets to a plant, there is no danger of over-fertilizing and burning the roots. Economical: One container can fertilize hundreds of plants. Seagate is unusual in the health food industry because we harvest and process our own raw materials, including cactus, grapes and olive leaves. A recent project, freeze-dried sweet organic carrot powder has even required that we operate our own organic farm in order to produce carrots that are 100% free of chemicals and pesticides.